Both Skip and Racheal Have been gifted with a passion for art and the faith to TRUST God with it. Their medium of choice is flame painting copper. They recognize that only God could have knit them together to create such a unique combination of artistry with copper. Skip and Racheal studied fine arts at the University of Arizona in the 60's and 70's, and yet they never met there. Racheal's focus was drawing and painting on canvas while Skip's major was pottery and metal sculpture. Skip's love for copper however started in high school where his teacher praised his ability to hammer and raise a nice copper bowl. Out of college, he began working copper as a business and made copper clad candles. After the oil shortage in the mid 70's raised the cost of paraffin out of reach, he moved on to copper sculptures, fountains, lamps and fusion jewelry, some of which were shown in prestigious museums in the West. ​It was in 1981 that Skip began developing his unique method of flame painting. 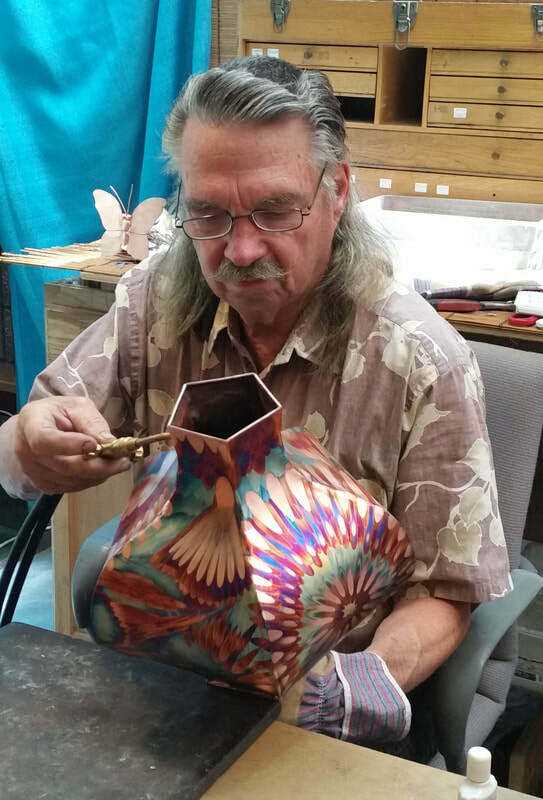 During his first 15 years as a coppersmith, he had watched the colors form around his solder marks and that led to his decision to discipline himself for 10 years to do nothing but butterflies for the wall. He made over 15,000 of them in a row. In 1996, Skip married his best friend and fellow artist, Racheal and they settled in Branson, Missouri. In 1999 they opened their own shop at Silver Dollar City, an 1800's theme park in Branson. It was at SDC in 2000 that Racheal finally let Skip put a torch in her hands and painting copper with a flame has become her medium of choice. After having an instructional video produced in 2005, Skip became known as “the father of flame painting”, because in this video he began sharing his technique with the world. They moved to the Branson Mill Craft Village that year, a wonderful indoor venue, and in 2009 they retreated to their home studio to do art shows for 3 years. Since doing road shows is so physically grueling, this duo settled in Mountain View Arkansas in 2012 and opened a shop at the Ozark Folk Center State Park's Craft Village. 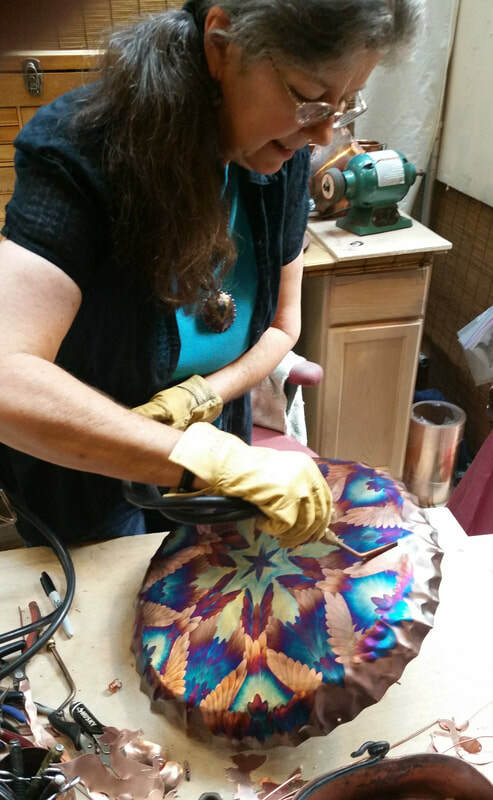 Alongside 23 other crafters and wonderful folk musicians, they enjoy demonstrating their own unique method of flame painting copper. ​Together, Skip and Racheal make a wide variety of pins, jewelry, wall décor and free standing vases, plates and bowls. Skip displays an exciting flare for the abstract and innovative 3D effects while Racheal creates intense color combinations with a particular gift for symmetry.